THERE’S SOMETHING TRULY magical about setting sail under a warm Caribbean sky. The night is inky black under the light of a plump moon as thousands of stars twinkle above. It’s just before the midnight hour and we’re about to hoist anchor and leave the dock in Barbados. This experience is particularly enchanting if your ship happens to be a Windstar yacht and you’re readying for the sail-away ritual as those white canvas beauties are unfurled to the powerful and stirring music of Vangelis’ 1492 – Conquest of Paradise. Photo courtesy of Windstar Cruises. Easing our way out of the harbour, sails billowing, it’s exciting to be setting off for the week, along with the 300 other happy, fortunate souls onboard. We are now one entity, guests and crew together, sailing the seas; salt spray and wind in our hair, the breeze at our backs, anticipating sunny days, crystal-clear water and tropical beauty. 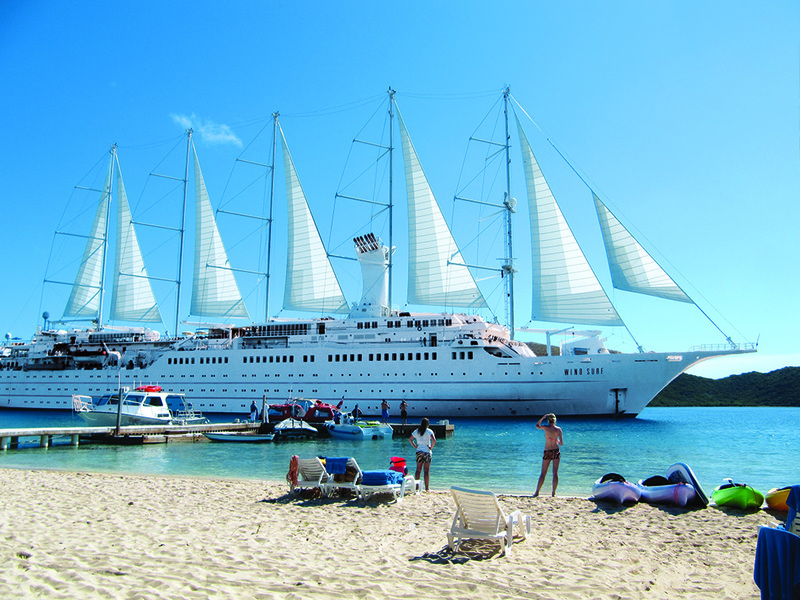 This gleaming white yacht is the Wind Surf, which offers a variety of cruises – Caribbean in the winter, (from St. Maarten round-trip in 2019) and the Mediterranean in the summer. She is the largest in a fleet of six, that includes two other smaller sail yachts – the Wind Spirit and Wind Star each with 148 guests, and three motor-powered yachts, Star Legend, Star Breeze and Star Pride each carrying 212 guests. We’re ready for adventure, awe-inspiring experiences and great camaraderie with other like-minded cruisers. We’re going to terrific destinations, that for some, are more off the beaten path than customary, in a Caribbean Sea that many of us know so well. We sail south and our ports of call, on a seven-day itinerary dubbed the “Jewels of the Windward Islands”, include Pigeon Island on St Lucia and its capital of Castries the following day, a beach stop at Anse Martin in Martinique, St George’s, Grenada and Mayreau and Bequia both in the stunning Grenadines chain. Even if you’ve heard of these places it may well be that you have not yet visited. As we cruise along we find carefree island vibes, gorgeous beaches and a colourful way of life which complements the onboard Windstar lifestyle – a casual, yet up-scale yacht atmosphere. Even better, there are no jackets required and certainly no ties. Casual summer dresses for ladies and long pants and a collared shirt with sleeves for the men are the perfect attire in the evening. Daytime is mostly swimsuits, cover-ups, shorts and comfy shoes. We swim and snorkel, we laugh, exchange stories and explore. We climb up to old forts, stroll small passages and pathways, minding the goats and chickens, visit local markets and dine ashore on fresh fish accompanied by long cool drinks. We take photos of laid-back locals, giggling schoolgirls, Rastas and boat builders in Bequia, boys playing soccer and ladies strolling about their island business. Meeting the locals is surely half the fun. The laid back yet elegant style of cruising with Windstar is perfectly suited to this kind of ship as well – all goes hand-in-hand, especially with the expert ministrations of a fabulous crew.We are able to cruise under sail power some of the time, depending on the trade winds and then with help from the motors at others. Because the sails are powered, we sail smoothly and cut through the waves in a very comfortable fashion. Guests are always welcome to take advantage of the open Bridge policy, to study the charts and engage with the Captain and his senior officers. AmphorA Restaurant. Photo courtesy of Windstar Cruises. Our gorgeous resort at sea gives us the opportunity for lots of outdoor living and the opportunity to dine on deck al fresco for almost all meals if desired. The service is warm, friendly and attentive and one of the treasures of this cruise line is their staff – many have been with the company for years. Loyalty is valued here and returning guests are often seen greeting staff members with big hugs. Our yacht is truly ship-shape and runs like clockwork. 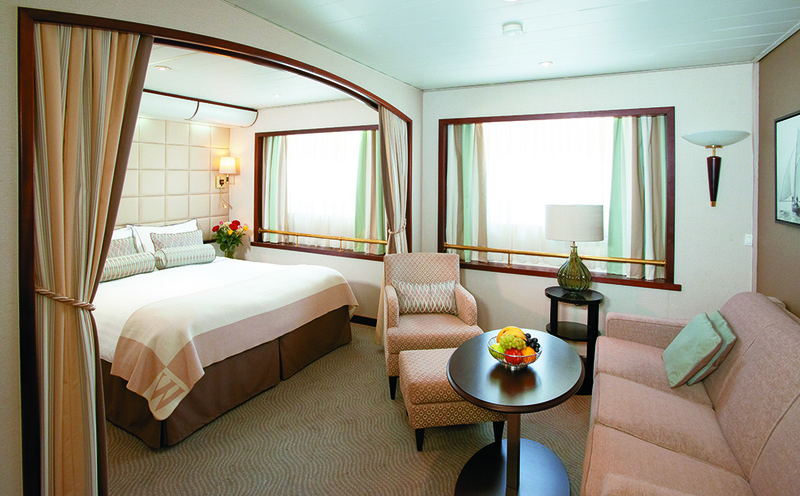 Staterooms are spacious and well-designed with lots of storage and every amenity one could want. The atmosphere is fun and light, yet at all times you’re aware that the service will be impeccable. Of course, the food is fabulous and the Surf provides many different choices. We enjoyed the elegant main restaurant, AmphorA, which offers open-seating dining for dinner with excellent cuisine and wonderful menus that change daily. Windstar has a very successful partnership with the James Beard Foundation and every evening there are special, tasty selections on the menu courtesy of some of the chefs from the Foundation. The intimate Le Bistro offers an alternative dining option with a smaller menu focused on French cuisine – escargots or lobster bisque anyone? Dining on deck under those stars is always a joy at sea and Candles is open most nights on the top deck for casual dining. On some evenings you can “Dine under the Stars” with a limited menu around the aft pool – mostly buffet style. Reservations are required for all dining except AmphorA and on embarkation day there’s a simple process to choose which nights you prefer to dine in certain spots. You can supplement those dining choices depending on space availability through the week. 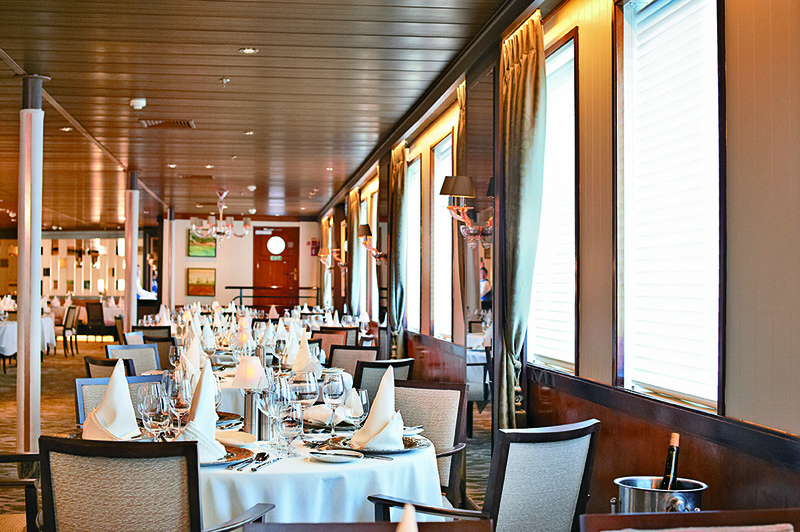 For lunch and breakfasts the Veranda offers a myriad of choices with indoor and on-deck dining. And naturally, there’s 24-hour room service. One of the best nights of each cruise is the fabulous Signature Deck BBQ which covers about three decks, featuring surf and turf choices and an array of fabulous food. The buffet is incredibly popular – only exceeded by the great show that follows, including line dancing with the crew. This is a must-do and invariably occurs when the ship is in port later in the evening. Ours was held in Grenada as we did not sail until 10 p.m.
And there’s more; the WindSpa, a small gym/fitness centre and a watersports platform (weather dependent) which is lowered when the ship is at anchor, for all manner of fun sea activities. Note: on the first day be sure to check out your snorkel and flippers. You’ll keep them for the week. Suite aboard the Wind Surf. Photo courtesy of Windstar Cruises. The yacht has a small casino, several bars and lounges – a favourite is the Compass Rose indoor/outdoor bar and lounge with a duo playing each evening and a great spot for sail away any time of day. Have fun playing Name that Tune or participate in Liars Club with the crew and get to know your fellow cruisers. On this ship, a great deal of your enjoyment will come from meeting like-minded guests and mingling with them through the day and at dinner. 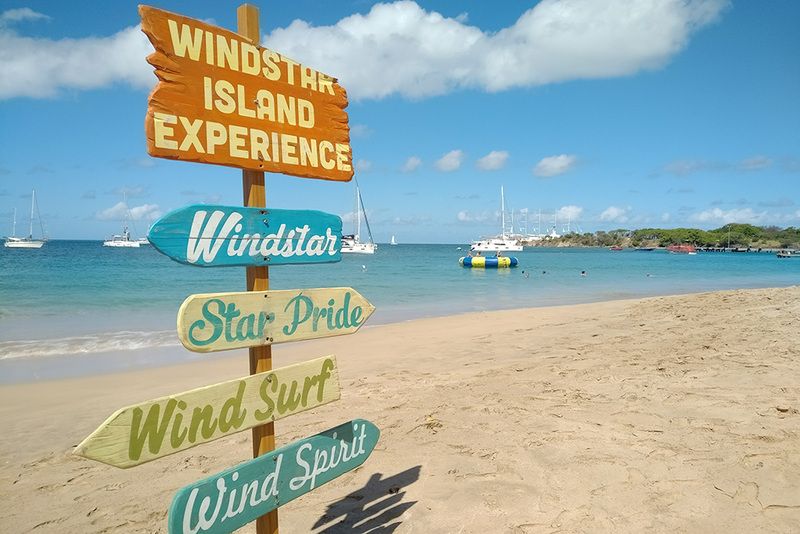 Every week, Windstar picks a great island or beach for another special event – the signature Island Experience which features a day of watersports from the beach and a tasty barbecue lunch. The staff lays out paddleboards and kayaks, snorkel gear, sail boats and plentiful lounge chairs on the beach for all to enjoy. On our cruise, this day was in charming Mayreau, the smallest island in the Grenadines, with a population of less than 300. We essentially doubled the population that day and it was the perfect spot – crystalline water, a wide sandy beach and rum punches galore. Life at sea under sail on the Wind Surf and her sister ships is definitely magical – it’s freedom personified, and it will lift your spirits and charm your soul. 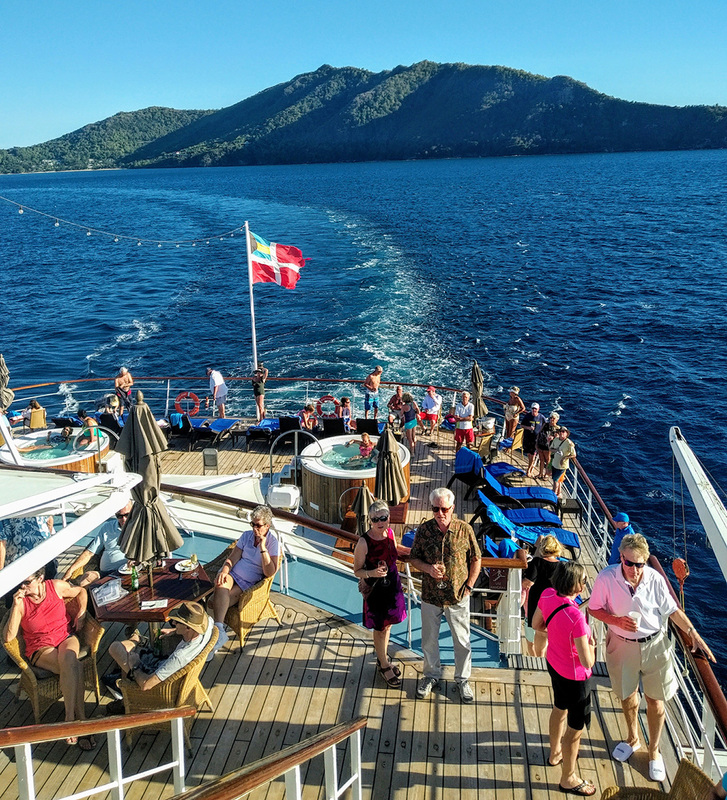 IF YOU GO Windstar Cruises’ fleet of six small yachts sail in the Caribbean and Costa Rica, Alaska, French Polynesia, Asia, The Baltic, Europe and the Med. Ask your travel agent for more information or go to www.windstarcruises.com. Written by Vanessa Lee. Originally published in Cruise & Travel Lifestyles Fall/Winter 2018 issue. Main photo courtesy of Windstar Cruises.